As you're animating, you might find that you are constantly selecting the same pegs, drawing layers, bezier points on a deformation envelope, part of a character rig, etc. 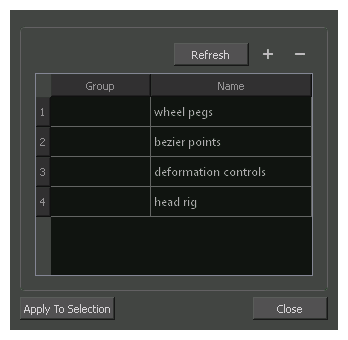 You can create a preset that automatically selects any defined element or group of elements. In the Scripts Manager, in the Files section, select the file TB_SelectionPreset.js. In the Functions section, select TB_SelectionPreset. The TB_SelectionPreset script button is added to the Scripting toolbar. 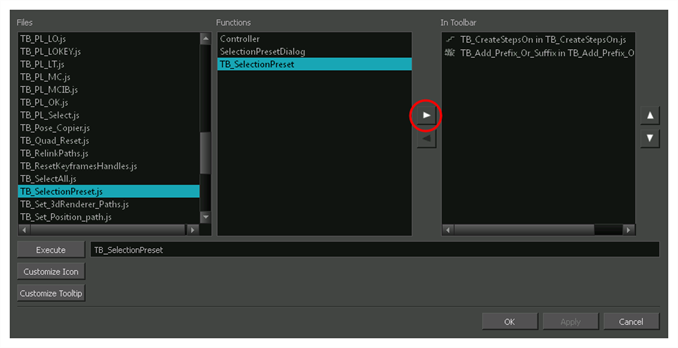 In the Scripting toolbar, click on the TB_SelectionPreset button. The Selection Presets window opens. Removes any highlighted zones from the Group column. Opens the Save Selection As Preset dialog box. After entering a name for the new preset and clicking OK, a new Selection Preset is added to the Selection Presets list. Note: before clicking on the Add button, make a selection in your scene of the elements for which you wish to create a Selection Preset. Deletes the selected Selection Preset from the list. Double-click in this area, next to the Selection Preset you wish to use, to select the elements defined by the preset. Displays the name of the preset. Selects the elements defined by the selected preset from the Name list. Closes the Selection Presets window.